How do I delete a lesson from my classes on EngageK12! The short answer is that to delete a lesson from a class you need to send us an email for our team to delete it for you. 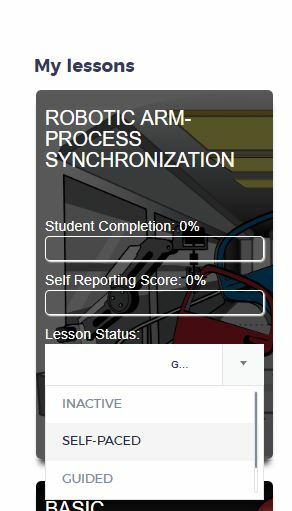 Please email support@RobotLAB.com with the name of the class and which lesson in that class you want to delete. We will delete the lesson or the class within 24hours when the request is made during working days. In the meantime, you can create a new class if you really want to start fresh or just keep working on the current class and ignore the lesson that is soon to be deleted. By the way for the students to see a lesson and be able to access it, you need to choose one of the two modes " Guided" or " Self-Paced". Only then your students will be able to access the Lesson. We hope this post was helpful! Let us know @ support@RobotLAB.com , we love to hear your feedback.